We usually start this route with a gentle stroll through the Kirstenbosch Botanical Gardens. It is an ideal way to warm up the hiking legs and to get an overview of the stunning variation of plant life in the Cape Floral Kingdom. There is a danger that you can get stuck here for longer than anticipated, so it is a good idea to allow time to return at a later stage and to take this as an overview. From the contour path the trek up the shady Skeleton Gorge should take roughly an hour and a half at an easy pace, with time for photograph and rest stops. It is steep in parts with a series of ladders about half way up, that finish in a rocky section, going straight up the stream bed. Although generally dry in summer, the ladders and the rocks in this section can be very slippery in wet or even damp conditions and extreme care must be taken. The river runs in winter and particularly after heavy rain, it is best avoided. At the top of Skeleton we meet Smuts Track, named after war time Prime Minister of South Africa, Field Marshal Jan Sumts, who was a keen hiker and user of this route. This path leads all the way to Maclear’s Beacon, the official high point of Table Mountain at 1085 metres. It is a clear path in most places, but there are a few intersections and rocky areas where it can be misleading, especially in heavy mist or rain. If you know where to looka, at the end of January & beginnig February you may be lucky and see some of the unique Red Disas on this route. The walk to Maclears takes between two and a half and three hours, with a further 45 minutes to the cable station. From the top of Skeleton Gorge there is also an alternative to take the path in the opposite direction to Nursery Ravine and various other routes to return to Kirstenbosch or to other access points. 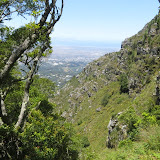 Allow 5 – 6 hours hiking from Kirstenbosch to Table Mountain, with a further hour if descent trek via Platteklip Gorge. Taking the cable way is an option, weather permitting.